This question comes up every once in a while. Partially it’s due to random doomsayers, and partially it’s due to Lara Croft: Tomb Raider, in which there is a planetary alignment causing widespread … actually, I don’t know what it causes, I haven’t seen the movie. This is a difficult question to answer. First off, as an astronomer I have to point out that the planets aren’t all in exactly the same plane. If one of these alignments occured, when you looked down on the solar system from above you would see the planets in a line, if you looked from the side at the same time, some would be a little higher, and some would be a little lower. Everything I’m reading is pointing to the fact that even that sort-of alignment probably won’t happen. On May 5, 2000, the Earth, Sun, Mercury, Venus, Mars, Jupiter, and Saturn were close to a line, but it wasn’t perfect. Check out this simulator, you’ll have to type in 2000-05-05 in the date field. You’d think that with the planets going around the Sun for 5-10 billion years we’d get a perfect alignment at least once, but it looks like the math just doesn’t work out. 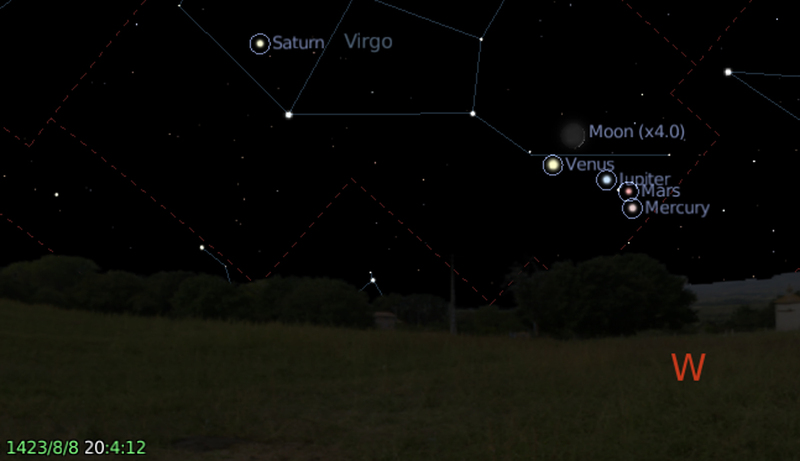 On 12/12/2012 the planets will be in this position. That looks pretty lined up – but don’t forget – the line those planets (and the Sun and Moon) are all aligned on? It’s the ecliptic. The Sun, Moon, and planets are all ALWAYS lined up along that line somewhere. Always. Even right now. Go turn on your Stellarium, turn on the ecliptic, and set it for today, right now. You’ll find every planet on that line. And the world isn’t ending. Hmm. And you won’t see it – this is during the day. Sarah, don’t forget that you can use one of the blank tiles in Scrabble for that third “y”! Hmm. If I knew what you were asking for, I’d definitely post it or put up a comment about it – can you be more specific? Is it possible to simulate future alignments? with reference to 2012 end of mayan calander rumors of either planetary magnetic shift causing widespread havoc or melting of polar caps causing costal flooding. thanks! You can use the website mentioned above (Planetary Orbit Simlator) to simlate the planetary alignment for yourself on any date you choose. Check out the date of 12:12:2012 and see all the planets lined up. During December 2012 there will be the best conjunction ever. Oh, and the end of the Mayan calander. Get Stellarium or Starry night backyard. I’ve posted the image from Stellarium on 12/12/2012 above. Unfortunately, the alignment is not much more dramatic than what happens every day, and definitely not as close as some of the fun conjunctions we’ve had in recent years. The confluence on 5/5/2000 was much closer. That’s my brother’s birthday too! I’m interested in what you might make of the confluence of planets that happened on August 8, 1423 right around sunset (I have mine set for Manhattan at 10 ’til 7 PM pointed West in Stellarium). Is that a “one-off” event, or is it something that would happen again? If so, when? Charity, sorry it took me so long to get back to you. Ooh! That looks like a cool conjunction, I would have loved to see that. I don’t feel like going all the way through the math, but I would suspect that a conjunction similar to that could happen again. I don’t know when. I’ve posted the planetary orbit simulator image of that event above. About the birthday thing, i was born on March 10 1981, have a look at March 10 1982 “the Jupiter Effect”. I was looking at websites for the next major conjunction, syzygy, or collusion. Any idea? I didn’t know about the book “The Jupiter Effect” … it looks fun, albeit about as accurate as Laura Croft in terms of the effect on Earth since there won’t be one. For the next major conjunction/syzygy or whatever, yeah, I’d play with those simulators. Around the 10th of April 1128 is the last time this happened, i’m not sure of the exact date, but i’ve just been playing around on that website and the 10th of April looks about right. Well my question is what will the alinment look like from New Mexico? Can anyone help out? It won’t. There isn’t an alignment. Os planetas não será alinhado em 2012/12/12. As estrelas não estarão alinhados em 2012/12/12. Nada será alinhado em 2012/12/12. Sinto muito, eu não falo Português. Eu só falo Inglês e Espanhol. Eu usei o Google para traduzir as instruções acima.